☞ DATE & TIME: Thursday, April 18– Drinks and snacks available from 7pm at the cinema bar; Screening at 8pm, followed by a Q+A with the director, Claire Burger. 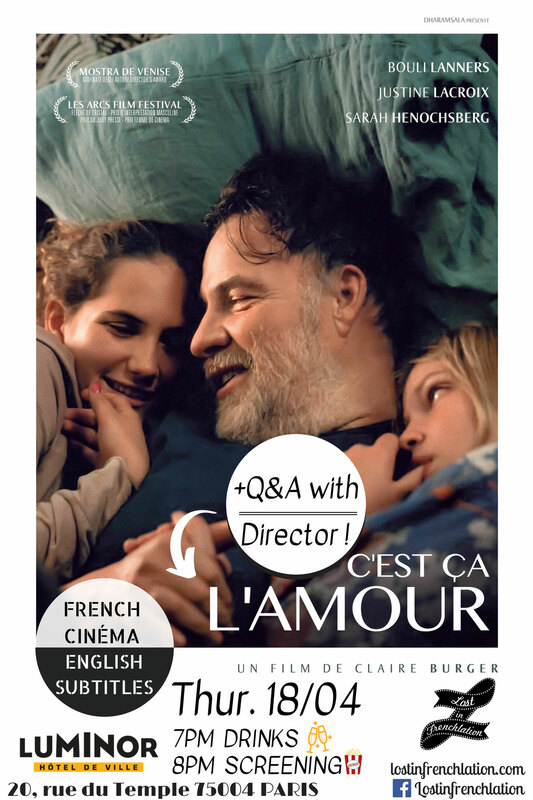 A distressed father of two gets involved in community theater when his wife leaves him in the tender family drama Real Love (C’est ca l’amour). French filmmaker Claire Burger, who also won the Camera d’Or in Cannes in 2014 for « Party Girl », pushes her audience to question what it truly takes to make a home with this moving portrayal of parenting, proving herself once again as a phenomenal filmmaker. The screening will take place at cinéma Luminor Hôtel de Ville, located in the area of Le Marais, by Centre Pompidou. We will be offering a selection of Parisian drinks and snacks during our cocktail hour from 7pm. Then, at 8pm, the screening begins, followed by a Q&A with the director in English! Tickets available both online and at the cinema.